Companies today face increasing challenges that weren’t there in decades past. With rising global competition and fast-paced shifts in market demands, virtual teams have become a core component for even the largest companies in the world. Employees want the ability to work remotely and companies want it too, but are still navigating how to handle the management of these teams. With remote teams comes the requirement for virtual meetings. You need to get your teams together in the same way that you would in a traditional office setting to ensure that they are working toward the same goals. The fast-changing technology has provided many tools for running virtual meetings, but running one effectively requires some foresight. Virtual meetings will go much more smoothly when everyone in the meeting has a role to play. The person who calls the meeting is typically not the only person with a topic to bring up or presentation to present. More so, they should be responsible for managing the group dynamics within teams that may extend across cultures and languages. Depending on the type of meeting you are conducting there may be many roles that you could potentially assign to those that attend. Try to shake things up by giving everyone a different role in each meeting and rotating the types of roles that you give to each person. Meetings are more successful when everyone knows what will be discussed prior to going into the meeting. It gives them time to study the subjects that will be discussed and formulate their own opinions and questions before going into the meeting. Try to distribute the agenda and other materials at least a day in advance to give everyone plenty of time to come up with their own discussion topics. The more effort that you put into the materials prior to the meeting, the higher the likelihood of a positive outcome. Distributing the materials too early could be detrimental. Try not to send out meeting materials more than a day or two in advance of the actual meeting, otherwise, the meeting attendees may forget about it and forget to prepare for the meeting. Sending out the meeting breakdown one to two days before it takes place is a good time frame to secure maximum engagement and preparation from your team. There are few things more frustrating to remote teams than using a new piece of software every time that you have a meeting. Find the right virtual meeting software and stick with it. Make sure that you have detailed instructions on how to join the meeting for your specific virtual meeting solution. Make things easy on your attendees and you’ll notice that you have fewer meetings starting late, with less time waiting for people to figure out the technology. It may seem like a small thing to waste a few minutes, but when you multiply that lost time by everyone on your team it really starts to add up. The same can be said for tech disruptions in the middle of meetings when time is lost. Having these things planned out ahead of time can save you measurable amounts of money and help the meeting to be more engaging for those that attend. The best meetings are interactive meetings that keep those that attend engaged. That can be easier said than done though. To have a truly engaging meeting, you need to plan ahead of time. Working engagement into your PowerPoint presentations and the segments of your meetings is important for keeping everyone engaged with the content. As your meeting kicks off, plan ample time during each segment for questions and comments. Even if you are setting an agenda, receiving feedback and opinions from your virtual teams are important. They will have different requirements and concerns than your typical traditionally employed person and it is important to get their perspective when you debut new initiatives. One of the biggest mistakes that many virtual managers make when they hold meetings is having too much on the agenda. Because you don’t see each other face to face every day, there is often a lot more than has to be covered in each meeting, but you should push back against this concept. Try to boil each meeting down to one specific purpose. What is the goal that you would like to accomplish with the meeting? What is the problem that needs to be solved? Of course, it’s impossible to ensure that every meeting has one singular topic of discussion. However, limiting the meeting to as few topics as possible will help to ensure that each topic receives the necessary attention, without inundating your team with too much information. At the end of each meeting, give your team the chance to pose their own questions and raise any concerns that they might have. You have to facilitate an environment where they feel comfortable speaking and sharing those concerns. Additionally, a lively meeting that keeps everyone engaged will make them more likely to want to ask questions because they aren’t constantly thinking about when the meeting will come to an end. Give everyone the chance to participate and they will be more involved in future meetings as well. 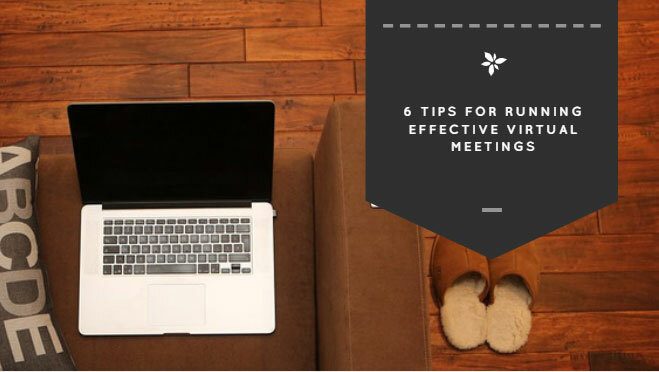 Running effective virtual meetings is all about getting all parties involved in the discussion. If you want them to digest the information that they are presented they have to be engaged with the discussions that take place. The effectiveness of each meeting often boils down to planning and preparation. Planning how you will facilitate engagement and give people the chance to express their opinions will be the defining factor in how well each meeting goes.